This painting by Ngwe Gaing is typical in its use of heavily but carefully applied brush strokes and the array of complex colour designs. It shows worshippers flocking to the Ananda temple complex in Pagan (Bagan) in Upper Burma, for the annual temple festival held on the Full Moon Day of January. The early twelfth century Ananda temple complex continues to this day to be a centre of worship. The temple is steep and there is no access to the upper levels, suggesting that the primary purpose of its builder King Kyanzittha in ordering its construction was to earn merit. It is signed ‘Ngwe Gaing’ in the bottom right corner. U Ngwe Gaing is one of the great masters of Burmese modern painting. 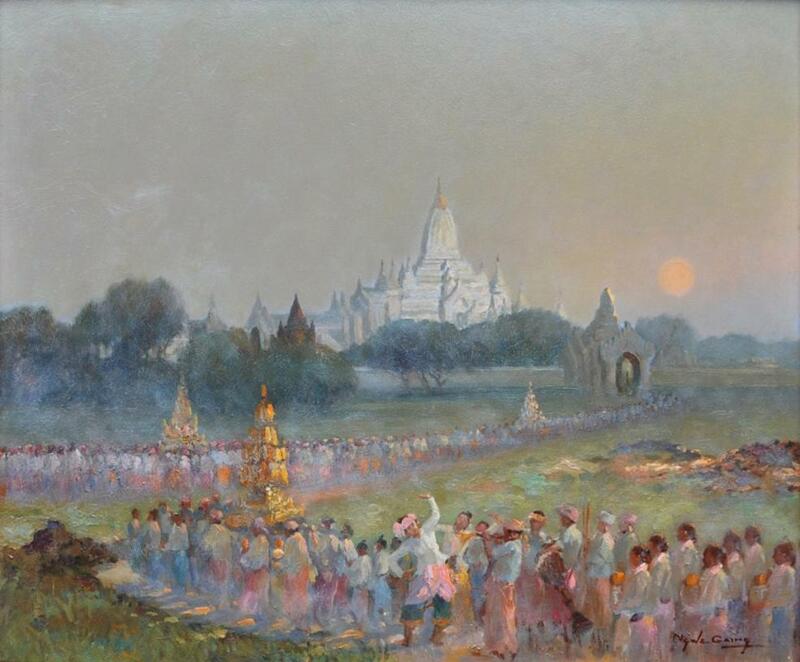 He has become one of the most sought after of all Burmese painters. U Ngwe Gaing’s versatility, technical skill and influence on a generation of Burmese painters mark out his outstanding contribution. He spent a year in England in 1952 where his job was to paint copies of Burmese antiquities held largely in the Victoria & Albert Museum. 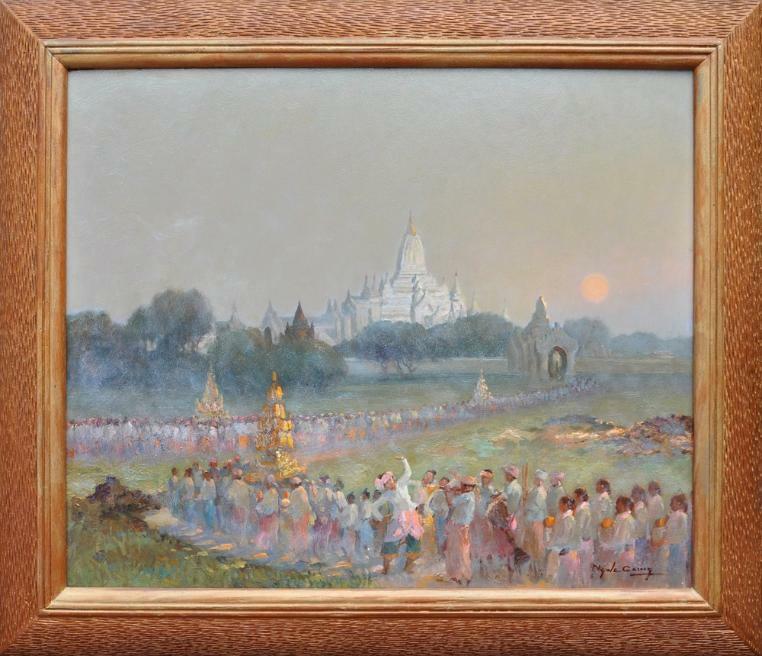 Alinga Kyaw Swa, the highest title accorded to an artist, and which only one other painter has received. In his private life, Ngwe Gaing was also a well known alchemist and clairvoyant, these still being popular pastimes for many Burmese. Works by Ngwe Gaing are in the National Museum of Myanmar, the Singapore Art Museum and other prominent regional collections. Several of his works are illustrated in Ranard (2009). Khin Muang Nuynt et al, Myanmar Painting: From Worship to Self-Imaging, EvoHeritage, 2006; Ranard, A., Burmese Painting: A Linear and Lateral History, Silkworm Books, 2009; and Falconer, J. et al, Myanmar Style: Art, Architecture and Design of Burma, Thames and Hudson, 1998.